Finally. The rain stopped long enough for us to get a softball game in. Too bad I never had the opportunity to break in my new first base glove. You see, I had no choice but to get a specialized glove for the position I play. Our shortstop, Silent Bob, has an arm that can rifle the ball at me which can potentially break a hand. Up until this season, I've been using an infielder's glove and let's just say I'm not going to play with fire anymore. The problem with a new glove that has not been broken in is the stiffness. The chances of me dropping a ball just increased threefold. Of course, to some of my teammates, that is no different than usual. Hey, I can't help it if I got food on my mind. For all I know, the softball being hurled at me resembles a really large takoyaki! So despite a short bench and a couple of dropped balls (on my part), we were able to eek out a win. With the game out of the way, our focus turned towards food. 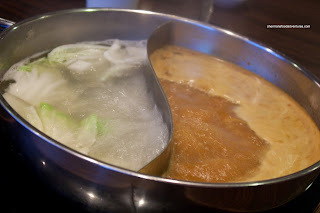 Seeing how the weather has been rather chilly for May, we decided to utilized the last remaining cold days for hot pot. With our close proximity to Richmond, we headed in that direction searching for a boiling pot of broth. The first thing that came into my mind was So Hot So Pot. Located at the East end of Alexandra along restaurant row, the name elicited many giggles. 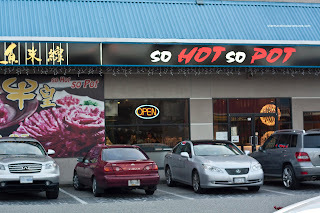 Yah, the name is easy to ridicule; but honestly, what Chinese restaurant has a "normal" name??? Anyways, as we walked into the place, we were pleasantly surprised how modern and spacious it was. We've had our fair share of hot pot experiences in less-than-clean environments, so this was a plus. We were seated at a spacious round table and quickly ordered our food. Once again, much like every other hot pot joint out there, the broth is an extra charge. Thus, it is really a good idea to go in a big group to split the costs. We decided to get half Chicken Broth and half Satay. The chicken broth was a bit weak while the satay was predominantly peanutty. Everything pretty much arrived at once, so I was busy snapping photos while everyone had to wait. Boss Woman was impatiently asking if I was "done yet". So if the photos look sub-par... blame her! 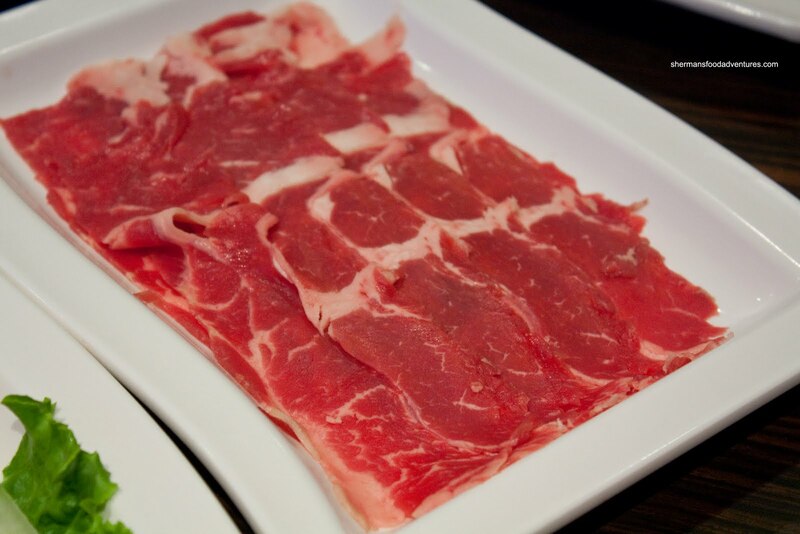 One of the standards of Chinese hot pot is fatty beef. In this case, it was labeled as Marbled Beef. Whatever the case, beef with fat and sliced thin is usually buttery soft and delicious. In this case, it was good. 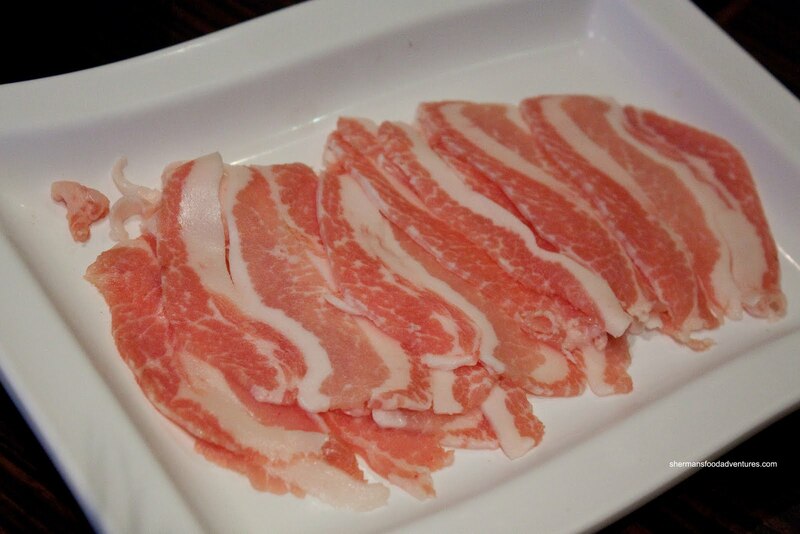 Another popular items these days is Pork Jowl or cheek. The meat is fatty; yet at the same time, it exhibits a gelatinous-like chew. This was no different here. Then arrived a dish that no one wanted to touch other than Boss Woman and myself. Pictured in this plate of offal was Beef Stomach (honeycomb tripe), Pork Intestine, Beef Tripe (bible tripe), Beef Tendon and Pork Kidney. 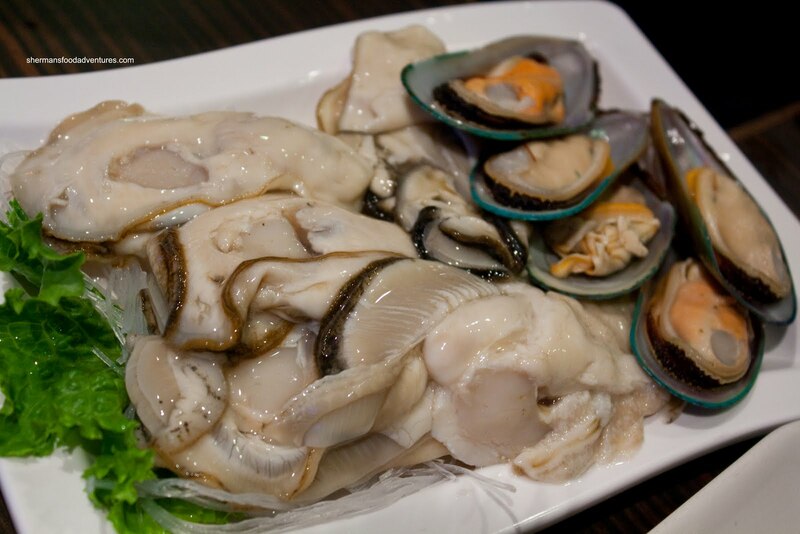 The 2 types of tripe were prepped correctly so they were easy to chew once cooked. The intestine was pretty much the same except for one really chewy piece. The tendon was also soft and easy to eat while not falling apart either. The kidney was cleaned properly so it didn't exhibit much gaminess. Next dish consisted of Beef Balls, Cuttlefish Balls, Shrimp Balls, Fish Tofu, Wontons and Chive Dumplings. As with many places these days, all of the meatballs are fresh, not frozen. The good thing about this is that they cooked quicker. The bad thing is they are harder to put into the broth as they stick together and to the plate. We shouldn't complain though, fresh is better than frozen. Mind you, I'm sure some of the raw ingredients were previously frozen anyways... The wontons were pretty much typical pork wontons while the chive dumplings were well-received all around. Something that caught our attention on the menu was the Xiao Long Bao. Nothing special about it really; but we've never boiled XLBs before. 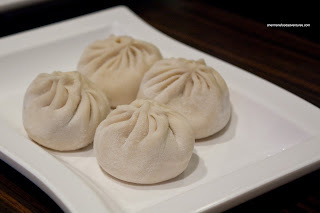 Normally, a good XLB has a thin dumpling skin; thus boiling them would result in a disaster. Well, of course these had thicker skin and therefore, they stayed intact. By just looking at them as a regular dumpling, they were actually quite good. The meat had a nice texture and meaty taste. When the plate of Oysters & Mussels arrived, it drew a reaction. Maybe it is foreshadowing a different type of "reaction" from eating them? Ahem. I'll leave that to your imagination. The actual response was to the size of the oysters. They were really large. Even after cooking, they had not shrunk by much. We were pleased at the freshness of them as well. As for the mussels, they were your typical frozen New Zealand green lip variety. We also got some White Shrimp and these were the imported frozen, then defrosted variety. Nothing wrong with that considering the price we paid. 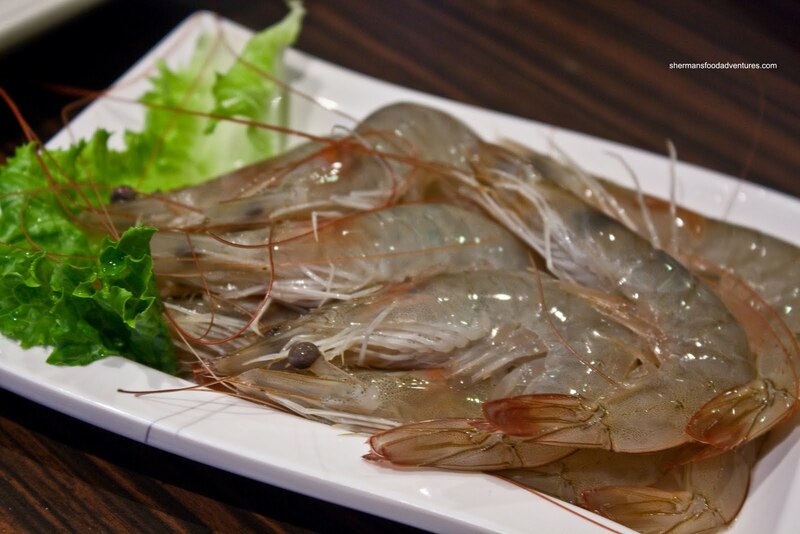 We weren't expecting live spot prawns! There were some other items we had and they were more than acceptable. 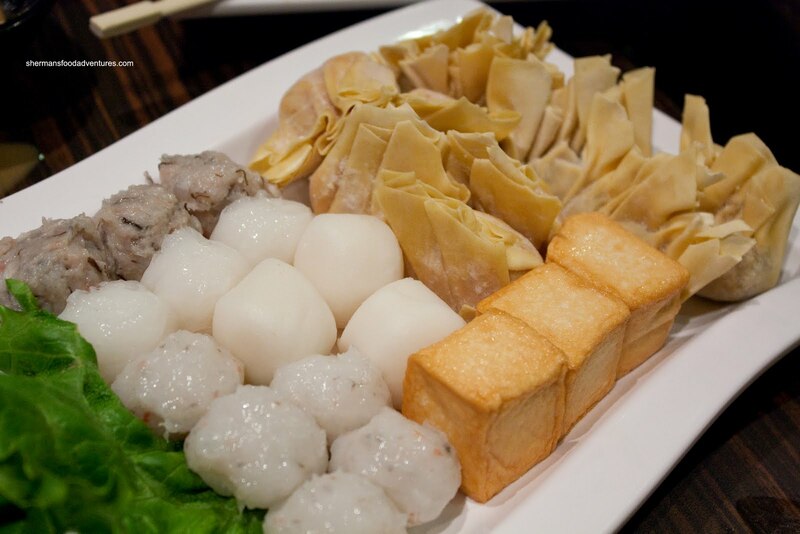 After all, hot pot is pretty simple - fresh ingredients = good hot pot. The service we received was not bad considering the nearby competition. Everyone left happy and really full. @LR I gotta admit. I was thinking about that before I ate there. Too bad it was decent. I really wanted to use that line!